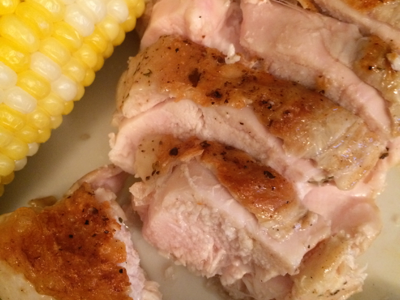 As threatened, today I made my first ever sous vide chicken. I feel pretty awesome right now, we’ll see in 24 hours or so if I’ve poisoned myself. Optimism rules, and photos follow! The raw materials and the mise en place. The authority assures me that you can safely cook in ziploc freezer bags, as long as the temperature doesn’t get too high. So, here I go. I wanted to use boneless skin-on breasts, which are hard to find. No photos of me boning the chicken because (a) it’s been a long time, I turn out to be rusty at it and (b) I didn’t dare touch my phone while I was all chickeny. I was going to cook two and then I had a moment of panic: I think my biggest pot is too small to circulate water adequately around 2 breasts at once. So breast 2 is in the fridge, I’ll do it tomorrow. 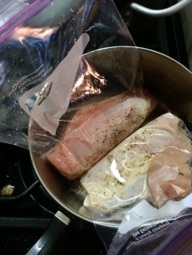 I put a little canola oil in the bag with the chicken, and some seasoned salt and pepper. Kept things simple. 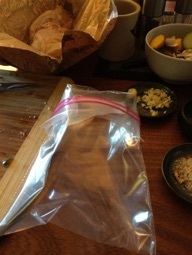 There’s a neat trick to get the air out of a ziploc when sealing it: submerge it (carefully) up to the top in water, and let the water pressure push the air out for you. 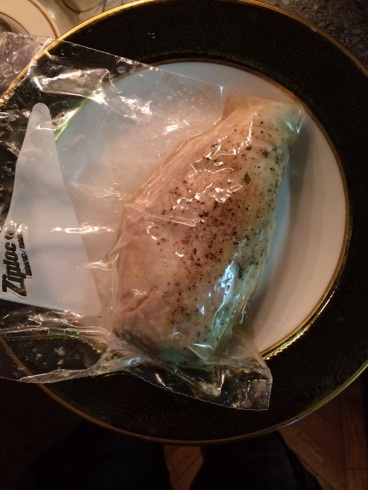 Having no vacuum sealer, I'm glad someone thought of that. 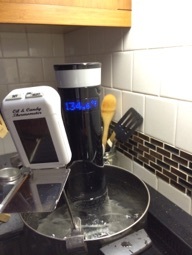 Meanwhile I decided to make sure the thermostat on the Sansaire was correct, so pulled out my candy thermometer. The verdict: if it’s inaccurate, they’re both equally so. Which seems unlikely. 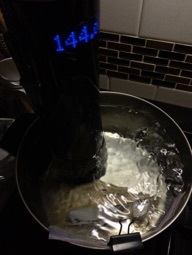 I decided to do the breast at 144 Fahrenheit. Modernist Cuisine at Home and Serious Eats both say 140, but a little more seemed prudent and given you’re “supposed” to cook chicken to 165, still radically lower in temperature. These are before and after shots, though they look more or less the same. I should’ve aimed at the chicken more. Anyway, I dunked it for 40 minutes, then opened the bag (carefully!) and took its temperature (also carefully!) to verify that it was indeed a bit above 140 internally. Modernist Cuisine at Home says let it go for 25 minutes after that to sterilize. 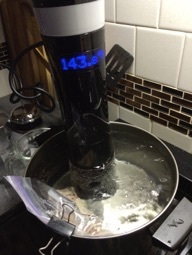 I went for 45, because I was in no rush, and sous vide means it’s almost impossible to overcook. So if you’re doing the math, that’s about 95 minutes of cooking time. Doesn’t look too promising in the bag. 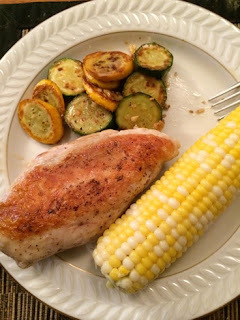 But I had a skillet at the ready with super hot oil, and plunked the chicken in for a quick browning. And here’s the really finished product. I did a much worse job than I usually do with the plating, mainly because I was so excited to cut into it. And eat it. Here’s the inside. 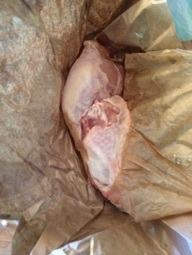 It wasn’t exactly pink but it definitely wasn’t the usual cooked chicken color either. Let’s call it pinkish. 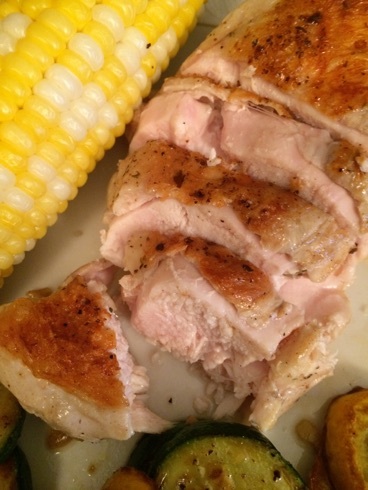 But texture-wise it was great, and seriously I’ve never had a chicken breast as moist as this one. Much less one that I cooked myself. I think I want to do this a few more times before I do it for company...chicken being kinda dangerous, I want to make 100% sure I’ve got it down, and that I don't food poison myself, much less other people. But I could do pork chops for company any time! The Sansaire adventures will continue!